The focus of the exhibition is on the emotions generated through the game as experienced by the many people whose lives are affected by it in some way and how that impact is depicted by visual artists in any medium. and 7 October – Rachel Mackay – President, Glen Eira Artists’ Society Inc.
Exhibition includes an activities area for children, organized by Glen Eira Kindergarten Association Inc. and an Installation – ‘Living Room of a St Kilda Footy Tragic – created by members of Glen Eira Artists’ Society. Memorabilia from this Installation will be on sale by silent auction to raise funds for the Rotary End Trachoma in Australia by 2020 Project. For a gold coin donation, be photographed at one of Gillian Schofield’s two remarkable photoboards. View the artworks and exhibits and vote in the People’s Choice Awards for the Individual Artist and the Community Group Award for a chance to win the Random Voter’s prize in either category. 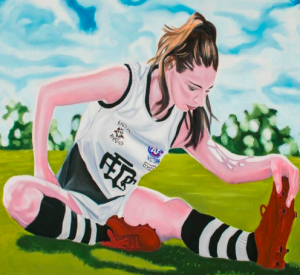 Aussie Rules- Passion and Pain Exhibition presented by Rotary Club of Caulfield Inc. Proudly supported by Glen Eira City Council and Murrumbeena Community Bank, with assistance from Collingwood and St Kilda Football Clubs and their passionate supporters.